Tomorrow’s manufacturers will be tattooing solar inks onto flexible materials, bending them in-shape, and making buildings and other creations that generate electricity. Though the ingredients for this future are here today, we’ve just joined hands with an innovative roofing and cladding company, as well as a state-of-the-art printers to run to the horizon. Photovoltaic panels, or solar cells, take sunlight and turn it into electricity to power our energy-hungry lives. The technology is renewable, not relying on finite resources, and is environmentally friendly, not producing atmosphere-warming by-products. The panels themselves, though, are not as widespread as they could be. They are expensive to produce, which makes them non-viable for some businesses, and they are heavy and rigid, which limits the roofs they can sit on. But just like hefty tablets, there is a paper-thin alternative. Printed solar panels are cheap, light-weight and flexible. Not only do they throw these production and installation issues out the window, but they open new doors for renewable energy tech. Picture a solar cell phone case — charging your smartphone would mean leaving it on your desk’s sunny spot; an awning made of solar cell could power your outdoor light; customised decals on your car door could charge your battery. Just imagine a brighter tomorrow, those ‘My Family’ stickers could actually contribute something. Printed solar cells aren’t just flexible, though, they can be produced as a semi-transparent film, too. Solar cell film could laminate your kitchen windows and power your fridge; a solar cell greenhouse could energise your plants and sprinkler system. We can already see printed solar cells as a flexible technology with near endless applications, and so have taken their production to pilot-scale. Currently we can print cells as small as a coin or as large as an A3 sheet of paper and with energy-conversion efficiencies of up to 15%. But these are early days and the technology has some way to go. As it stands, large-area printed solar cells only generate energy at a fraction of the efficiency of traditional panels, and so they are not yet able to be installed at larger scales. 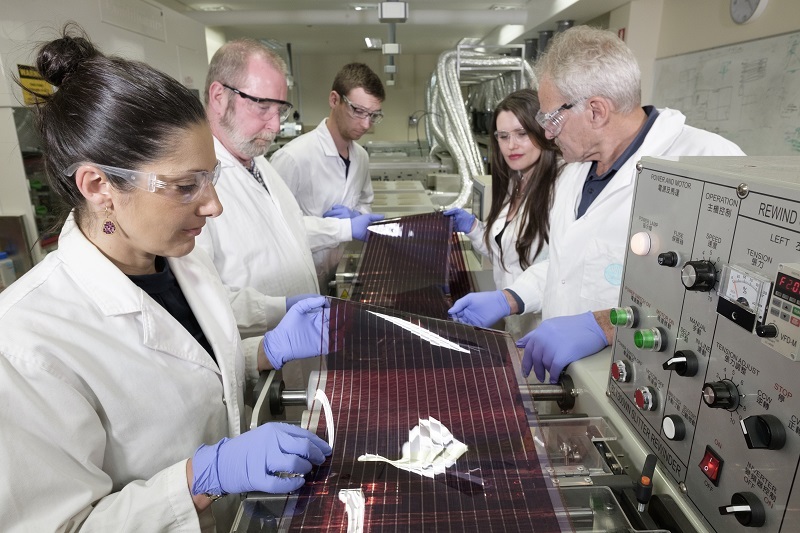 To iron out these issues and make printed solar cells a mainstay of renewable technology, we’ve formed a research co-operative with two groups (and solar film-enthusiasts): Solafast and Norwood, that specialise in exactly these solutions. The research co-operative will run for two years. Along with Solafast and Norwood, the fellowship will use our combined expertise to deliver a new rig of power to the lights of more doors. It’s partly funded by the Cooperative Research Centres Projects (CRC-P) programme, which supports industry-led collaborations between industry, researchers and the community. Over the next two years, Solafast will provide the materials and testing infrastructure for the developing printed solar film. Our team is acting as a guiding force for the project, introducing both groups to the challenges associated with printed solar cell technology. Our researchers have been working with printed solar cells for some years and are well-placed to improve the technology and steer it towards a practical and applicable state. 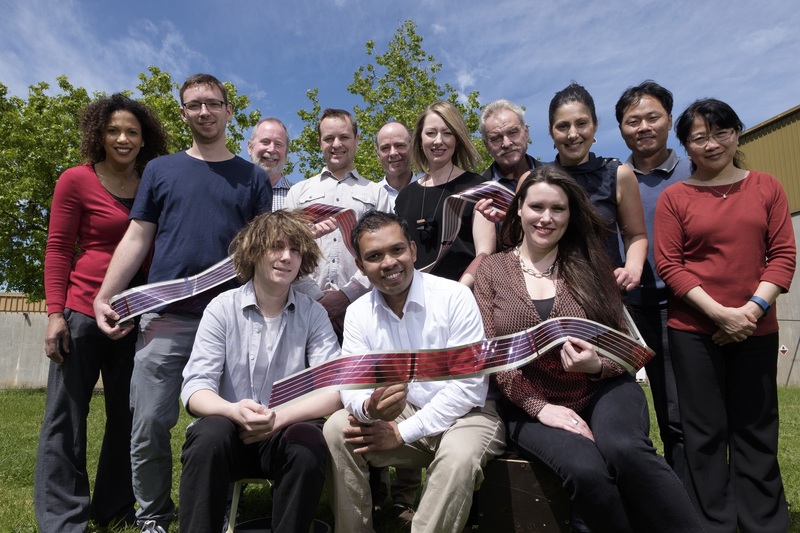 Together, the printed solar co-operative will meet three main outcomes after the two years: the project will 1) advance the inherent technology of printed solar films, 2) drive the technology towards a functional product that can be demonstrated to industry, and 3) result in all three groups having elevated skills in the industry. Convincing the commercial market, too, is another primary goal. Australia has the world’s best rate of solar installation for residential, but this vastly eclipses solar uptake in the commercial market — a market that has been valued at $250 million and is set to rise drastically over the next five years. The research co-operative aims to deliver a viable, applicable film which will then drive its uptake in industry. This will be showcased with a 100 m2 printed solar demonstration finalised at the completion of the project. The future of solar film is bright with countless applications — imagined and otherwise — on the horizon. And this research co-operative has us, Solafast, and Norwood uniquely placed to be industry leaders as printed solar technology gets its time in the sun. You can find out more about our industrial innovations here. Is it possible to adhere the transparent film version onto a polycarbonate substrate so it could be used as a semi-transparent roofing material. I use a lot of 3mm thick opal polycarbonate in my designs for house roofing as it is tough, hail proof (tennis ball sized hail a couple of years ago caused no damage to a clients roof) and let’s visible but not much UV light in?